A live concert with Mim Suleiman and her friends. Mim Suleiman is a boundary crossing performer reaching deep into her African heritage, blending traditional Tarab vibes with jazz, soul and funk. 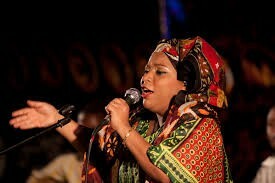 She has performed with some of the greats including Baba Maal, Robert Plant, Amadou and Mariam and Damon Albarn. Her latest gathering of talent: Elias Gargallo (drums), Ash Milburn (bass) and Phil Baxter (guitar), join her for this special concert. Mim mainly sings in her native language Swahili, but occasionally uses other languages such as English and Fulani. She is best known for her track Mingi, which features on Soulwax FM in the Grand Theft Auto V soundtrack. In 2009 she also performed at Glastonbury and WOMAD festivals (UK) as well as led workshops. Don't miss her singing workshop - open to all - the next day at The Gregson!